This salad packs a lot of interesting flavours into each bite. From the peppery taste of fresh arugula to the salty appeal of Kalamata olives, preserved lemons and feta cheese, there is nothing bland or boring about this dish. 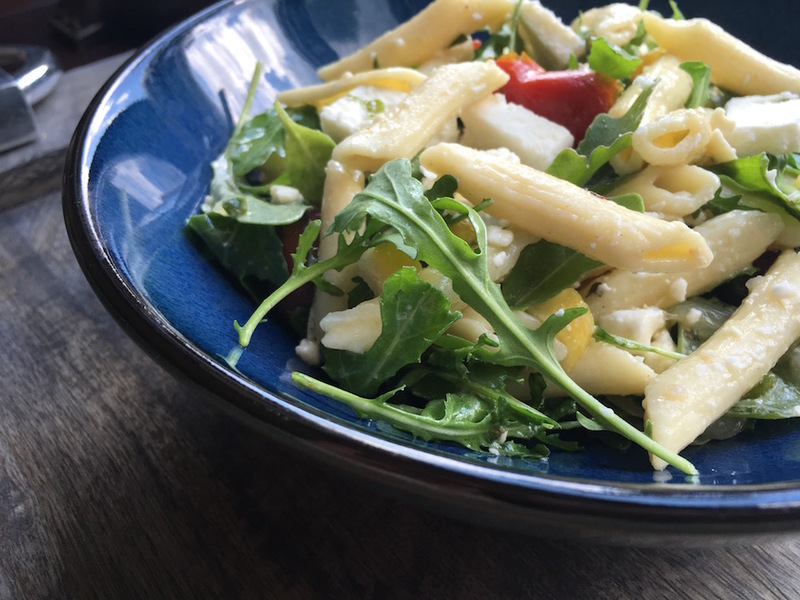 Yet, its strong flavours aren’t overwhelming because they are tempered by the satisfying addition of penne pasta and fresh herbs. This robust salad has enough presence to serve as a light, yet satisfying, main course – or it can act as the perfect complement to more neutral dishes, like grilled chicken breast or a mild white fish. NOTE: You can use fresh or preserved lemons to make this recipe. I recommend trying the preserved lemons because they add more intense flavour. You can either buy a container of preserved lemons or easily make your own with Himalayan salt blocks. A word of caution, however, if you use preserved lemons, taste before adding additional salt. To make the vinaigrette, whisk the olive oil, vinegar, lemon juice, and mustard together in a small bowl until blended smooth. Season with salt and pepper and set aside. In a large bowl, combine the cooked tomato and garlic mixture with the basil, oregano, olives, red onion and preserved lemons. Add the cooked pasta, arugula and both types of cheese. Finally, add the vinaigrette and toss to combine. Season with salt and pepper, to taste. Cover and refrigerate until ready to serve.